A few of you might remember the legend of Lassie, the dog who traveled many hundreds of miles to reunite with her beloved human, Joe. While such a story may seem fantastical to some, we at Friendicoes have living proof of dogs who came back home…to US! Today we tell you the stories of Bawna, Garibu, and Ghodu. They were street dogs brought into the Friendicoes City Shelter like every other sick or injured dog that the ambulances pick up every day in answer to some distress call. But they created uniquely beautiful stories of their own. After the vets and para-vets nursed them back to health and they recovered completely, as per protocol they were released back into their territories. …much to our pleasant surprise. A shelter is a place with more ailing dogs than can be accommodated, and for a dog, it can be a very stressful environment. To be suddenly thrust in the middle of 200 odd other dogs (most of them moaning, whining, crying and sometimes screaming) and in a strange territory with movement restricted at the end of a chain or within the boundaries of a cage. Some dogs even associate it with the bad times when they were sick, in pain and scared and the majority brought in would make a dash of it given a chance. But what they do get at the shelter is regular nutritious meals, tons of love and attention along with the necessary medical care. And the smart ones figure out the easy life. Like our Bawna, Garibu, and Ghodu (and many others before them) who made it back through heavy traffic and packs of territorial street dogs, to make the shelter their permanent home. 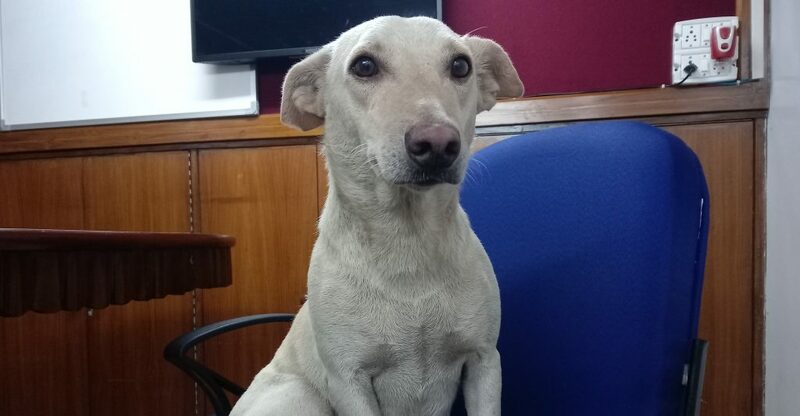 Bawna, a bow-legged adorably sly fellow, came in from Kotla Mubarakpur. He was reported for an ear infection. After a week of treatment, he was dropped back to his territory. But later the same day he was spotted back outside the Friendicoes shelter. Yes, that quick! And that is where he now hangs out. He can be spotted snoozing on a chair or a corner of any of the air-conditioned shops and offices outside when he is not busy chasing away other dogs from his territory. He takes his threats very seriously! But he will always make time for a pat and a scratch if you are interested. 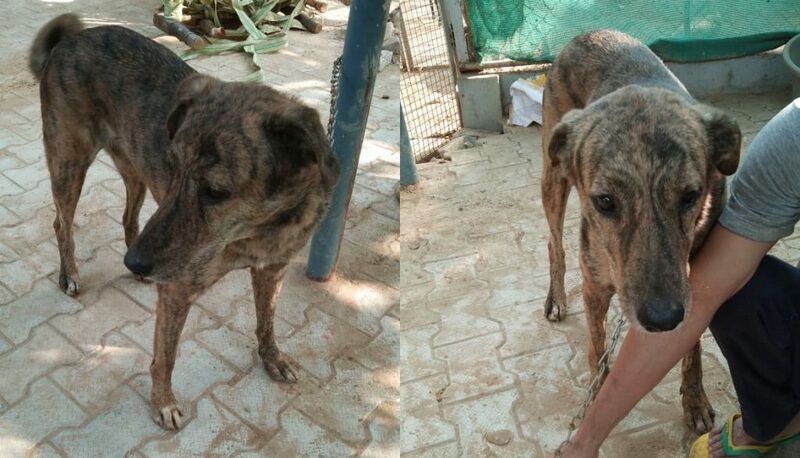 Brindle beauty Ghodu has found the secret to a happy existence. The kitchen at the shelter. He was brought in from the neighborhood colony next to the shelter when he was hit and run by a car. After he recovered from his injuries, he was dropped back to his territory, but little did we know that he was already in love with the menu at the shelter. So back he was. With soulful eyes that can melt any heart, he sits outside the kitchen and is generally a loner who is happy in his own company and two BIG MEALS a day. Garibu would rather beg for love than get photographed. Garibu, a fawn Indie with a black muzzle, is by far the smartest. He has figured out the best of both worlds. He spent 15 days at the Friendicoes shelter recovering from deep maggot wounds in his back, early last year. Later, after his release, he made his way back to the shelter but not to stay. 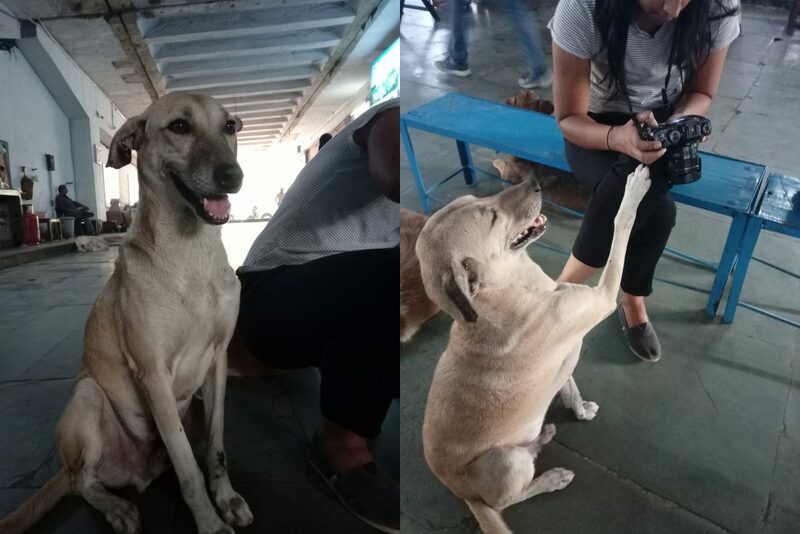 Since then he comes in daily (traveling a distance of not less than 3-5 km crossing packs of dogs and dodging traffic) to the shelter during evening meal time to grab a plate of food and demand some attention from visitors to the shelter and the clinic outside. 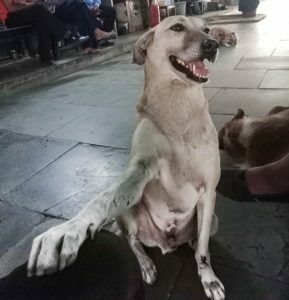 He has developed his , unique style of asking for attention by sitting next to you and first putting his one paw on your lap and then leaning against your leg till you keep scratching him. He repeats this with the person next to you and then the next until he has his fill. Obviously, nobody is able to refuse that smart move and innocent face. But once done he makes his way back to his own territory (the neighboring Lajpat Nagar) to eat the next meal served by his caregiver. We understand he eats not less than 3 meals at 3 different spots in a day. He is quite popular with regular visitors to the shelter who know him and ask for and after him. So many of you may be able to recall this charming, intelligent fellow whom you may have met at the shelter during your last visit. Remember to give him some extra cuddles next time. After all, he travels quite some distance for them. While the team at the shelter receives a lot of praise from our friends and supporters out there, for us the best compliment came from these guys. When they chose to return. There is something special in the innocent trust animals put in you and if you have earned it you can consider yourself to be blessed. As we do.